This entry was posted on Tuesday, February 12th, 2019 at 11:54 am. Stephen Cox (back row centre) with his students. 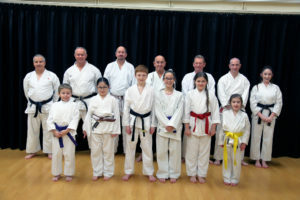 THE longest running karate club in Westbury is celebrating 34 years of training and instructing people of all ages in the town. The Westbury White Horse Karate Club was established in 1985 by sensei Peter Deveraux 2nd Dan under the Karate Union of Great Britain (KUGB); sensei Andy Sherry, now 9th Dan; Peter Bull 4th Dan, now retired and Japanese Karate Association (JKA) chief instructor sensei Keinosuki Enoeda (The Tiger), who died in 2003. The club is currently run by Stephen Cox 6th Dan who started his training alongside the founders, coming full circle to become senior instructor. Stephen said, “Throughout my karate experience, I have had the privilege to train with many great and well respected JKA and European instructors. I took over running the club when my sensei, Lionel Wheeler, gave up for personal reasons. “The club and I have now reached a milestone of 34 years of training and instructing in the longest running club in Westbury. The club still follows the teaching of traditional Shotokan Karate as taught by Gichin Funakoshi, sensei Keinosuki Enoeda and sensei Ohta, who myself and some of my students had the pleasure to train under sensei Ohta in 2018. “I still have students training with me from the early days; John McAllister 4th Dan, Steve Salter 4th Dan, Morph Mumford 4th Dan, Jason Willcox 3rd Dan just to name a few. I have also taught children and grandchildren from previous students. “The club has had a lot of success over the years, with numerous students representing England at home and abroad, bringing back an array of trophies, gold, silver and bronze. At local competitions we have never failed to return without a medal or two. This is due to the high standard that my instructors set, and to be the best, not the second best. The club meets on a Monday at Leighton Recreation Centre from 6.15pm to 7.15pm – Juniors and Seniors combined. Fridays at Matravers School from 6.00pm to 7.00pm – Juniors and Seniors combined. For more information about joining you can contact Stephen Cox on email: wwhkarateclub@hotmail.co.uk or 07800 776104. Your first session is free of charge.